The Sepor 9x16 mineral jig is a fixed bed design, selective simplex mineral jig for use separating heavy density material from light density material. The 9x16 jig has a screen bed of 9″ wide by 16″ long for a total of 1 square foot of jig bed area. The bed is covered with a stainless steel wedge wire screen with 3 mm openings. The Sepor jig is actuated by 1/2 Hp electric motor which drives an adjustable eccentric fixed shaft connected to a rubber diaphragm. By rotating the eccentric shaft, the stroke may be adjusted, reducing or increasing the action of the diaphragm. A rotating water valve is used to inject water into the diaphragm compartment on the upward stroke and reduce the effect of the suction stroke. An additional water inlet is provided for adding an additional water column through the bed while jigging. The jig is completely assembled on a sturdy structural steel frame. A 25 pound charge of 3/16″ hardened jig shot is included with the jig. Once the water supply is connected and regulated, there is little operator attention required during jig operation. The Sepor 9 X 16 Selective Simplex Mineral Jig has been used in gold, diamond, lead/zinc, and tin recovery operations. 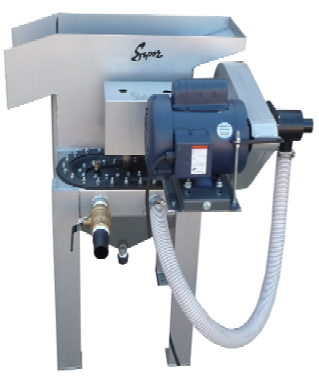 In the environmental field, the Sepor 9 X 16 Selective Simplex Mineral Jig has been used in soil remediation projects, to remove high density contaminates from the soil. The 9 x 16 jig is suited for laboratory, pilot scale operations or small production operation. 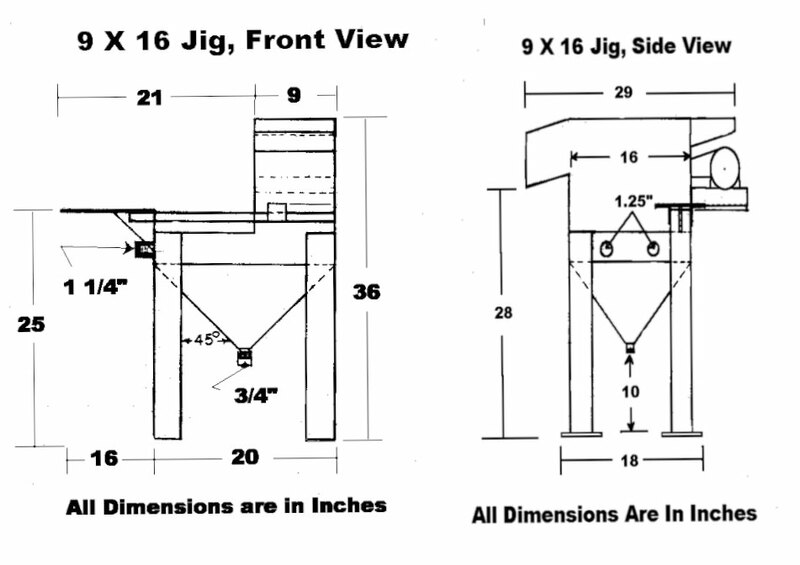 The capacity of the 9 x 16 jig ranges from 1/2 TPH to 1 TPH, depending upon the characteristics of the ore/feed material. 050G-016 9 X 16 Jig 115 V/1 Ph/60 Hz 200 lbs. 050G-017 9 X 16 Jig 220 V/1 Ph/50 Hz 200 lbs.